This book is an introduction to the history of the city planning profession in the United States, from its roots in the middle of the nineteenth century to the present day. The work examines important questions of American planning history. Why did city planning develop in the manner it did? What did it set out to achieve and how have those goals changed? Where did planning thrive and who were its leaders? What have been the most important ideas in planning and what is their relation to thought and social development?By answering these questions, this book provides a general understanding for further study of the extensive literature of planning and urban history.Donald A. Krueckeberg divides this work into three historical periods: an initial period of independent but gradually converging concepts of a planned city; a second period of national organization, experimentation, and development; and a third period of implementation of planning ideas in nearly all levels and areas of urban policymaking.Krueckeberg begins with revealing the origins of modern planning in the movements for sanitary reform, civic art and beautification, classical revival in civic design, and neighborhood settlements and housing reform. A second section covers the institutionalization of the profession; the rise of zoning and comprehensive planning; influential figures of the period; and the new communities program of the New Deal. The book contains case studies and focuses on the role of the planner and the effectiveness of the profession. 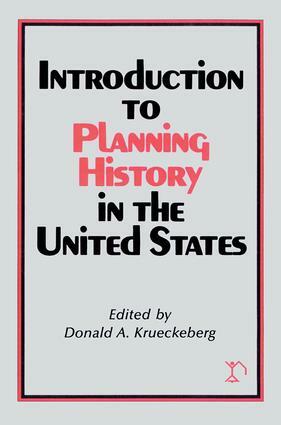 Krueckeberg concludes with a bibliography of planning history in the United States.